Cables and connectors There are 12 products. Connector 7/8'' male 0° on 7/8” female 0°, PUR-JBZ 5x1.5 gray 1.5m. Connector 7/8'' male 0° on 7/8” female 0°, PUR-JBZ 5x1.5 gray 5m. Connector 7/8'' male 90° on 7/8” female 90°, PUR-JBZ 5x1.5 gray 5m. Connector 7/8'' female 0°, with open ended wires, PUR-JBZ 5x1.5 gray UL, CSA+tracks 1.5m. Connector 7/8'' female 0°, with open ended wires, PUR-JBZ 5x1.5 gray UL, CSA+tracks 5m. 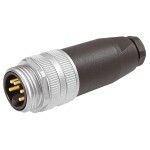 Connector 7/8'' female 90°, with open ended wires, PUR-JBZ 5x1.5 gray 1.5m. 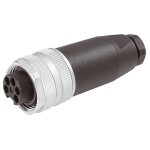 Connector 7/8'' female 90°, with open ended wires, PUR-JBZ 5x1.5 gray 5m. 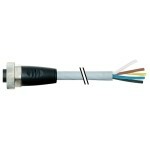 Connector 7/8'' Female, 3-pole 0° field-wireable screw terminal, unshielded. 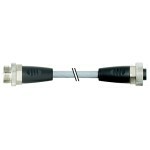 Connector 7/8'' Female, 5-pole 90° field-wireable screw terminal, unshielded. 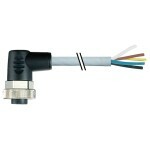 Connector 7/8'' Female 0° Field-wireable screw terminal, unshielded. 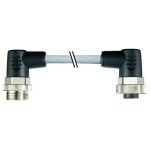 Connector 7/8'' Female, 3-pole 90° field-wireable screw terminal, unshielded.